The current default color palette (standard.soc) used in LO has 167 colors across 14 rows and this is way to many colors for users to choose from, and the new color picker drop down only showing 10 rows at a time also doesnt help the situation. I would like to suggest that we crop this list to 8 rows by taking the first 7 rows and row 12. Also in the first row, we should move the black color to the right end of the row so the gradient is consistent on that row. An alternative is to convert the attached palette into a suitable sized palette that suits our purposes. Likely 12x8. Another alternative is to simply use the attached color palette along with a white to black gradient row. I'm not opposed to this. But if the color picker at 12 columns but showing just 10 rows is a problem, it might be a better option to expand number or rows, or even columns shown. Q: what would be the best layout of the color picker to accommodate a new standard.soc pallet? 2.) Wade Peterson's did some very compelling work for a device neutral color pallet, in bug 80196 -- it could/should occupy the lower rows of the standard pallet. > rows, or even columns shown. Expanding the number of rows doesnt solve the primary problem with the color palette, which is that there are two many colors in it. Most users need a small range of colors to choose from and now that we have the color picker dialog available in the drop down, those that want to choose an exact color now have easy access to doing so. I believe the current layout of 12 columns is fine, as all three of the suggestions fit it. We have a libreoffice.soc and i would have assumed it does cover any colors related to the branding. Seems interesting and it would be great for Wade to fill in the upper rows so it could be put into an .soc file so it could be tried. - We should not be limiting users from creating custom palettes with greater than 8 rows or a set number of swatches. The user mailing list has some threads with very large palette file attchments containing many hundreds of swatches. I am not a fan of these SOCs but people do create and use them. 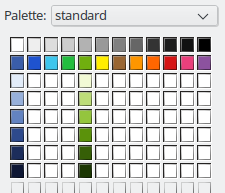 For example, it would be unlikely that the Inkscape palette would fit within 8 rows. - A scrollbar should appear for palettes with a greater numbers of rows than can be displayed. If anything the color picker dialog should resize, as possible, to display the largest number of rows / swatches. - Given the format of the XML entries it is both more logical and easier IMO to create palettes on a hue-per-row than hue-per-column basis. I explain the reasons for this in bug 80196. It certainly makes it easier to have a block of entries named "10% Magenta", "20% Magenta", rather than have such entries broken up one to a block. - Unless the colour picker layout reaches some sort of stability (so far there is no sign of this occurring) the number of rows displayed and the creation of SOC files to suit a given layout will remain problematic. > - Palette swatches in the current standard.soc affect legacy documents. ... be a separate palette created to include the excluded swatches. This could easily become messy. > swatches. I am not a fan of these SOCs but people do create and use them. There hasnt been any discussion in this bug report about limiting the number of rows to 8 for custom palettes. We were discussing what the default palette should be and ideally how many rows it should occupy. > possible, to display the largest number of rows / swatches. The scrollbar does appear when there are more than 10 rows in a palette, so there isnt a need for the dialog to resize to accommodate more rows. The dialog currently takes up 360 pixels, which is 40% of my screen height, and each color row takes up 18 pixels. Available palettes that are more than 10 rows are web.soc (20 rows), scribus.soc (46 rows), cmyk.soc (18 rows), html.soc (11 rows), and standard.soc (14 rows). > excluded swatches. This could easily become messy. We discussed this issue in the weekly design meeting a few weeks back and it will not negatively effect legacy documents, as the colors are stored in the documents as their rgb values, but yes we should duplicate the current standard.soc as a new palette file if we change the default palette. > broken up one to a block. The XML format simply provides the details of the palette colors, but not the manner in which it should be displayed. Most color palettes have gradients going top to bottom or bottom to top and i feel that is best to stick with this norm. Even LO's color picker dialog shows it in this manner when hue, saturation or brightness are selected. > creation of SOC files to suit a given layout will remain problematic. I think SOC files should define the number of columns per row, so that color palettes which were designed with a specific number of entries per row that isnt 12 (e.g. 10 or 16) can be shown as they were designed. > > creation of SOC files to suit a given layout will remain problematic. > isnt 12 (e.g. 10 or 16) can be shown as they were designed. Actually that would be a very valid UI change for the ColorPicker. In https://bugs.freedesktop.org/show_bug.cgi?id=80196#c19 Owen had to rotate the pallet because that scheme would require 13 columns rather than the 12 he had to work with in demonstrating Wade's proposal. 8-10-12-13-16 columns all might result in appealing pallets to work with. Q: Can the Widget for the ColorPiker be made dynamic to respond to the .SOC? Q: Failing that, could we agree change the ColorPicker column count to match what ever best fits our new standard.soc? > Actually that would be a very valid UI change for the ColorPicker. > all might result in appealing pallets to work with. When i looked at Wade's proposal, my first instinct was to have white to black as the first row of the palette and then have the colored ones going columns wise, as that is similar to how our current palette is now and white to black is not a color blend which could fit next to the other color range column wise. > Q: Can the Widget for the ColorPiker be made dynamic to respond to the .SOC? You would likely have to ask a dev familiar with the code to know this, but i dont think the drop down width changing multiple times when you go from palette to palette would be a good thing. What i think would work is that size of the palette color boxes change depending on the the number of columns per row. If we can set width of the palette color area to 230 pixels, we can accommodate 16 columns at 10x10, 12 columns at 14x14, and 10 columns 18x18 (these numbers are excluding the 2 pixels padding on the left and right of each color palette box). > what ever best fits our new standard.soc? Yes it should primarily accommodate whatever is our default color palette optimally, as other palettes are secondary, though i believe that a 12 column palette will cover all the bases we need and we will have 3 other 12 column palettes also in the palette list (web.soc, cymk.soc, and the current standard.soc). Details? Is it a .soc that you're proposing to add? Can you attach it, or you've only just a screen clip? > you've only just a screen clip? Saw it while i was watching this youtube video. Jay reopened the ticket because of missing pastel tones. Similar request comes from the blog post https://design.blog.documentfoundation.org/2016/12/30/new-color-palettes-in-libreoffice/#comments linking to http://www.imgup.cz/images/2016/12/30/proposal.png. With another algorithm to modify luminance it looks more flexible now. First lines are gray scale and basic colors, followed by saturation of 60%, 30%, and 15% and then luminance increased by 9.5, 7.5 and 5.0. Push or change? Saturation is done per ColorRGBToHLS(), luminance with ColorAdjustLuma(). Serious issue is that it has one line over the max. And I miss darker colors either by reduced lumination or saturation. Difference between RYB7 and 8 is unclear to me, 7 has better distribution with bright colors, 8 is better at darker. Both make rose and magenta rather a red and the red morphs into orange. If we go with a different standard palette the variations of saturation and luminance should be available as an extension. > Serious issue is that it has one line over the max. I have 9 rows, so not over the max. The max seems to have been jumping up and down between versions for some strange reason. > And I miss darker colors either by reduced lumination or saturation. We have a limited number of rows, so we can please everyone, we just need the colors to be sorted from lighter to darker. I find the colors better in 8, specifically the red's in 7 look more orangish. > Both make rose and magenta rather a red and the red morphs into orange. Rose and magenta are RGB colors variants and not RYB. Unfortunately you are a bit late https://design.blog.documentfoundation.org/2017/03/12/survey-standard-palette/. And actually I miss the grey scale. > palette/. And actually I miss the grey scale. I know, but I wanted to address the fact that the saturated colors in the third variant (which seems to be the most popular) don't match the ones with different shades (e.g. there are shades of orange under red). Of course I did not intend to omit the grayscale, it was just a quick mockup that did not include it out of laziness. Revert "tdf#105000, related tdf#87538: Make new color names translatable"
> the right end of the row so the gradient is consistent on that row. I think the most important thing is that the user detects the ordering schema easily. Why not use a layout of 16x16 (==256) color cells? No scrollbar in the color picker, please! That would be inefficient for the user. > > rows, or even columns shown. > Why not use a layout of 16x16 (==256) color cells? 16x16 would be an odd size to use--and to compose palettes in. See some of the discussions in bug 87538 regards 12x10 with scroll bar appearing beyond 10 rows. And, with the Standard palette now recast (at 6.0, and refined at 6.1) to a generated 12 column RYB color wheel of primaries, secondaries, and tertiaries (Yellow, Red, Blue--Orange, Purple, Green--Gold, Brick--Magenta, Indigo--Teal, Lime) using RGB values--the 12 column UI is positionally significant supporting RYB additive color design. The tonal.soc was also laid out on a 12 column GUI widget. So holding 12 columns makes functional sense. We've kicked around the idea of extending the palette XML (.soc, .sog) to allow it to control its layout in the Color palette widget. But until that gets taken up--a fixed width of 12 columns, with scroll bar when rows exceed 10, is generally sufficient.